The suite was renovated in October 2018 high quality and modernized. It is located on the mezzanine floor of an attractive small building. A tastefully decorated modern bathroom with outside windows, granite floor, a walk-in shower with a glass partition, etc. will inspire you. In the sunny living room (25sqm) with beautiful windows is a white fitted kitchen with ceramic hob, dishwasher, fridge freezer etc. integrated. In addition, it has uaein comfortable sofa (Breite1,60m), which can be easily transformed into a comfortable sofa bed. Further pieces of jewelery are the antique mahogany secretary, a oak chest, the designer chairs, the beautiful dining table in front of the window front and the original pictures of a Hamburg artist (Renate Knoth-Bernier). From the bedroom window your eyes fall on the green. A white comfortable double bed with single mattresses and bed bases vestellbaren and a built-in cupboard all feature. The floors are in white-gewischtem oak laminate except for the bathroom. The suite can comfortably accommodate up to four guests. Niendorf is a popular district in the north of Hamburg. The proximity of the apartment to the market Niendorf / Tibarg (5 min walk.) And the main bus station is an ideal starting point for discovering Hamburg in its diversity. The Tibarg is a lively shopping street with many shops, restaurants and cafes. From Niendorfer market, take a direct route, among others, Hagenbeck over, (2Stationen), to the exhibition halls (still 6 stations), the Jungfernstieg / Binnenalster (other 2 stations) to the HBF-North (still 1Station). Total travel time 20min. In addition, many buses from the central bus station / market Niendorf travel across Hamburg in all directions. Niendorf offers small and large green areas, including the Niendorfer enclosure as a recreation area, an outdoor pool, mini-golf, etc. Looking for a pleasant and spacious APARTMENT for your HH-stay? The suite is suitable for visitors to Hamburg, for exhibitors and visitors-for congress participants, for those who are curious about Hamburg and love the individual. On arrival at the car, leave the A7 Schnelsen, after about 4km you're there. If arriving by train get off at the main station should take the U2 to Niendorf Markt, yet a short walk and you have reached your destination .. If you arrive by plane, it is easiest for the first time to take a taxi. A car is not necessary due to the convenient transport links to the public transport network. The new bathroom has an interesting granite floors, white Italian wall tiles and an outside window to the west. The floor to ceiling large shower is bounded by a gläserenen partition. A hanging toilet, a heated towel rail, a closet u. V, m. all feature. Ample storage space is available. The suite is furnished to a high standard and offers coziness and comfort. The holiday apartment was completely renovated in October 2018. The location, the charm of the holiday apartment, the green surroundings, the easy accessibility of public transport to the city center and the harbor, the proximity of the Tibarg Center with its many shops and the excellent value for money will convince you. Great visit and wonderful property. Would highly recommend to all. Owners are a pleasure to deal with! Freundliche Menschen, komfortable Wohnung. Nette Aufmerksamkeiten wie ein gedeckter Tisch und Kaffee für's Frühstück im Schrank. Ich kann die Wohnung nur weiterempfehlen und würde auch selbst gerne wiederkommen. Schön eingerichtete kleine Ferienwohnung, in der man sich vom ersten Moment an wohl fühlt. Gut ausgestattete Küchenzeile, die eine problemlose Selbstversorgung zulässt. Alle Bedürfnisse des alltäglichen Lebens lassen sich im nahegelegenen Tibarg erfüllen. Zwei U-Bahn-Haltestellen und ein schöner Kinderspielplatz fußläufig in wenigen Minuten erreichbar. Die Wohnung ist eine gute Basis für eine mehrtägige HH-Erkundung! sehr gemütliche Unterkunft, auch in gut erreichbarer Nähe zu den öffentlichen Verkehrsmitteln (ca. 5 Minuten Gehweg bis zur nächsten U-Bahn-Station), das einzig Störende waren die Hühner eines Nachbarn, die meinten schon sehr früh am morgen loszugackern. Dafür kann man aber die Familie Siegert nicht verantwortlich machen, die auch im Vorfeld sehr zuvorkommend waren und auch bei Zahlungsunklarheiten mit fewo-direkt erstmal abwarteten. Insofern: sehr empfehlenswert!! Hamburg-Niendorf is a popular district in the north of Hamburg. It is characterized by beautiful single and multi-family houses and small residential complexes and greenery. From Niendorfer market, walk 6 min. From the station Joh. Mählmann Str. reached by a small park your goal in 4 minutes. 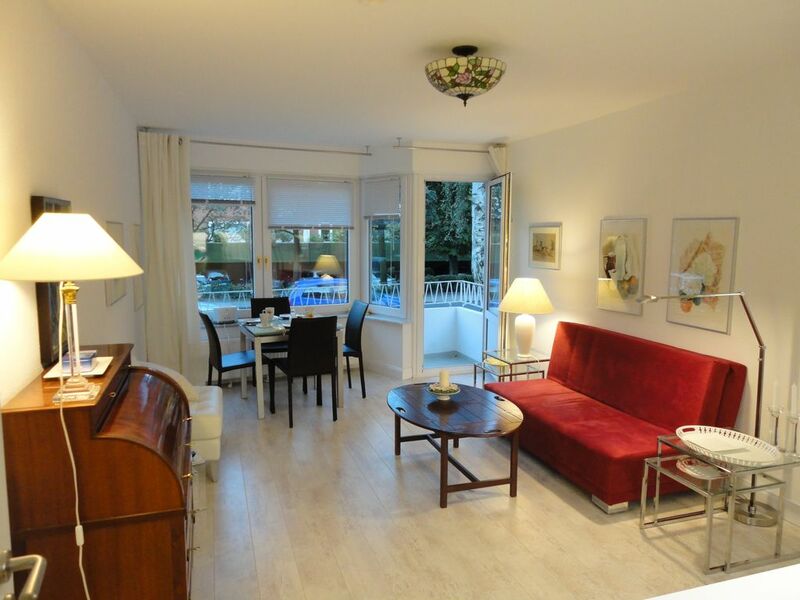 Due to the very good access to public transport (underground U2 and many buses (ZOB) from Niendorfer market), you are in about 15 minutes in the inner city (Jungfernstieg / Alster Lake). All other charming attractions, museums, churches, musicals, Port and Harbour City, the Reeperbahn, the railway miniature wonderland, etc. You can easily reach. Hagenbeck Zoo is z. B.Use the U2 two stations Kosljunska. To the exhibition halls drive without having to change about 12 minutes. The Easter Road, a very lively and charming shopping street, is only four stops away. Golf: The Golf Course Wendlohe is just 4 km away.